Esta colección parte de la idea de un pupitre para trabajar en casa. Tiene una línea muy ligera y algunas reminiscencias al “meuble a secret” y la era posindustrial. Al tener dos caras iguales posibilita compartir el espacio de trabajo dos personas y situar la mesa en espacios intermedios, o de separación de ambientes. Es una mesa que no busca una pared para encontrar su sitio, sino que lo encuentra en cualquier parte del hogar. El plano quebrado de trabajo nos sugiere aquellas mesas de oficina donde por un lado se acumulaba papel y por el otro salía ya trabajado (in-out), propias de la organización laboral del siglo pasado. This collection was born from the simple idea of working from home. It is lightweight and reminiscent of desks with hidden compartments from the post-industrial area. As it has two identical sides, it is possible for two people to share the workspace. Furthermore the desk can be placed in gaps or areas to separate living spaces. 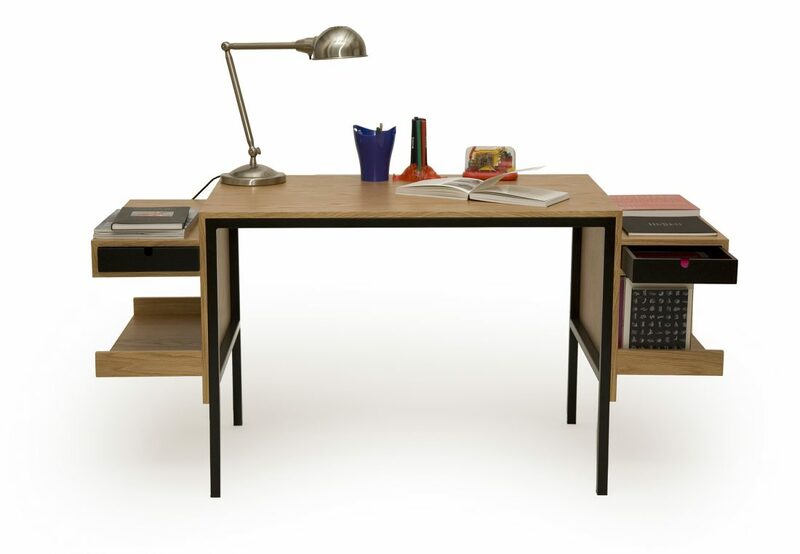 This desk does not seek a wall to be placed up against, it can be found anywhere in the home. The two-tiered work surface was inspired by the typical ‘in-out’ paperwork system in offices of the previous century. Paper was accumulated in one part of the desk, the ‘in-tray’, and once it had been dealt with, it was move to another part of the desk, the ‘out-tray’’. The desk is made of a 2,5 cm x 2,5 cm lightweight square steel structure, finished with baked epoxy paint and made in oak or castaño.